If you are looking for a review of all the best combination microwaves in the UK, you have found the right place. We review all the latest and best combination microwave models on the market, to give you peace of mind that you will be choosing the right product for your home. Below, in the table, the combination microwave reviews start with the most highly rated first, then descend accordingly. For people who are in a hurry, you can use the table. For people who want a more in-depth review, you can scroll further down the page, where we provide all the pros and cons for each. The Panasonic NN-DS596BBPQ is a powerful 1000W steam combi oven that lets you enjoy not only fast and fresh steamed food. It has an original 4-in-1 combination of features and functionalities of a microwave, grill, oven, and steam that offer quicker, healthier and tastier cooking. This means that whatever your meal, you can always get the best cooking results without compromising on the taste or health benefits whatsoever. The Panasonic NN-DS596BBPQ Steam Combi Oven turns cooking fresh and healthy food into an incredibly simple process that you can actually enjoy doing. The key features of this combi oven include the auto cooking function, the inverter technology, and the turbocharged defrosting feature. Also included are the Panacrunch for extra bite, and a flatbed for extra space. The auto cooking feature lets you experience even more straight forward cooking since the only thing you are required to do is set the weight of the food and press start. The rest will be taken care of by the Panasonic NN-DS596BBPQ Steam Combi Oven. The inverter technology, on the other hand, delivers graduated power sequences thus allowing food to cook evenly and thoroughly. The Panasonic NN-CF778SBPQ combination microwave oven is a 1000W combi oven with 27 litres of cooking capacity. It features that inverter technology that ensures optimum energy consumption thus preventing overheating and retaining the natural flavour of evenly and thoroughly cooked food. This combi oven satisfies our criteria for the most energy efficient oven for two reasons. The first one is the inverter technology that ensures continuous control of energy delivery. Secondly, it has the energy save feature which uses only 0.1W in the standby mode. The grill settings deliver up to 1300W thus facilitating rapid cooking. Despite having only 27 litres of cooking capacity, the Panasonic NN-CF778SBPQ still has more room for you to enjoy delicious meals thanks to the inverter technology. It is also worth noting that flatbed technology allows you to use large cooking plates of up to 340mm diameter. Enjoy large portions of grilled or baked meals with this 40L microwave that combines the functionalities of a microwave, grill and convection oven. It is one of the easiest to use thanks to the auto minute start setting that delivers a one-touch microwaving power. In case you get stuck anywhere while operating this combi microwave, just press the info button and you will see step by step guides on the digital display to take you through the cooking process. What is more exciting is that this combi oven comes with up to 11 microwave power settings that can be combined with 3 cooking stages. Other great features of this combi oven include the sensor cook that measure that measures the humidity levels of the food during the cooking process, the auto defrost feature and the quartz grill. The large oven capacity is equipped with a double layer cooking possibility allowing for large portions of food to be prepared at once. The Samsung combination microwave is a strong contender for other ovens. Starting with the interior. It is an antibacterial ceramic enamelled interior with high rust and scratch resistance. The switchable turntable function is something to talk about. The turntable can be switched on and off depending on your requirement. A pretty handy feature for processing those large dishes. Some of the Samsung features are Power Defrost, ECO mode, and Fermentation function. The Power Defrost feature helps heat frozen foods faster for cooking. Fermentation allows for preparing yoghurt and other fermentation products like bread. The ECO mode, as the name suggests, helps save energy to reducing the standby power. Some other features include deodourisation, reheat. The Samsung MC28H5013AS/EU is a featured-packed oven. The NN-CT585SBPQ Combination Microwave is a 1000W combination oven that features a cooking capacity of 27 litres and a compact body that makes it economical on kitchen space. Our tests revealed that it saves up to 20% more free work-top space, which is more than any other combination microwave in the market. Apart from saving your work-top space, the NN-CT585SBPQ Combination Microwave also provides you with a lot of cooking space. This is because the oven’s fan is not positioned in the back so that there can be enough depth to accommodate plates as large as 340mm wide. This combi oven like most of the other Panasonic models offers the benefits of flexible and speedy cooking. This is possible because the top fan distributes the heat more efficiently resulting in more even and consistent results. It also features the 21 preset auto menu for fast and easy cooking in your kitchen. This feature makes it possible to prepare a wide range of meals from frozen meat items to jacket potatoes. The Russell Hobbs RHM3002 Combination Microwave brings to your home 30 litres of multifunctional oven space not withholding any of the benefits of conventional ovens. Among the things you can do with this oven include grilling, baking, roasting, and baking as well as microwaving. It is an ideal appliance for a busy kitchen that handles dozens of cooking activities that require quick processes. The features of the Russell Hobbs RHM3002 Combination Microwave include a 1100W grill, a 2500W true fan assisted oven and a 900W microwave. Additionally, it comes with 5 power levels, 10 auto cook menus, weight/time defrost settings and a child safety lock. It has a removable glass turntable and a stainless steel interior that is easy to clean. It comes complete with a grill rack for browning and crisping your food. The Russell Hobbs RHM3003B Combination Microwave is a 30L capacity microwave that features a modern design which combines microwave cooking with grill power and convection oven. This gives you the ability to cook large portions of meals enough for both your family and friends. It comes with prescribed recipes, and these include the classic cottage pie, goats and onion tarts, ciabatta pizza and spiced apple pie. The Russell Hobbs RHM3003B Combination Microwave’s oven functionality is powered by a fan assisted oven that acts exactly the same way as a conventional oven giving you the option of an extra cooking facility. You will enjoy a relatively fast cooking experience with the Russell Hobbs RHM3003B’s auto cook menus that make programming your microwave simple and easy. It has a 31.5cm wide removable glass turntable and an interior that is stainless steel for easy cleaning. Also, it comes with a weight/time defrost setting, a child safety lock, and a simple, functional control panel. The accessories that come with the package include a grill rack and a baking tray. Russell Hobbs combination microwave rings all the bells and whistles of a perfect family microwave. Featuring a modern design, this microwave will not only complement your kitchen display but also cook or reheat large plates for all your family needs. It is encased in a white housing featuring a modern mirrored door finish. The microwave has a large capacity of 30 litres, and the combined aspect includes the microwave, grill and convection oven. This enables you to cook a wide range of meals in this unit to satisfy a large family. You gt to heat, roast, crisp and brown your meals with ease. Similar to a conventional oven, the true fan assisted oven provides the option of an extra cooking facility to enable you to cook for large groups of people. The Russell Hobbs combination microwave can cook meals fast and efficiently. This is aided with the auto cook menus on the unit that allows you to programme your microwave simply. The functional control panel on this microwave including clock and digital timer enables you to set the cooking time. Also on the settings, there is a weight and time defrost function, and a child safety lock. You get to use every feature on the unit as it comes complete with a grill rack and baking tray. It sits on a 31.5cm glass removable turntable, and the interior is made of stainless steel to enable easy cleaning. This combination microwave oven is manufactured in a stylish design with a black finish giving it a high level of elegance ideal for every kitchen setup. It has been designed to cope with a wide range of cooking demands. It has a fan assisted oven that works alongside the 1250W quartz grill and a 900W microwave to cook food in the 28L capacity cavity. In addition to these functions, the KOC9Q3T Combination Microwave Oven also has a keep warm function, one-touch cook menus a kitchen timer function, a more/less feature, and a child safety lock. This Samsung MC28H5125AK is a toned down version of MC28H5013AS/EU. So you will find some features missing on this oven like the switchable turntable. Other features are pretty much the same. It has 28 litres internal volume and consumes 900 watts of power. There are about 33 preset cook programs. You can choose between six microwave power levels such as the Auto Reheat/Cook features make for effortless cooking, or the ECO mode takes care of your electricity bills. Then there’s the Smart Moisture sensor which ensures your food remains hydrated. The dial and buttons make every feature available readily. In summation, utilising a combination microwave can be a great cooking experience because of the rapid results and the versatility they come with. You can find it difficult to grasp the know-how of operating them, but it gets quite simple along the way. Since combination microwaves are pricey kitchen appliances, you are advised to try as much as possible to stick to your budget and let your cooking needs determine the best one for you. You can rest assured that each of the above-reviewed combination microwaves is capable of satisfying the basic expectations. If we had to choose one that would be the pinnacle of the above, it would be the Panasonic NN-CF778SBPQ. A combination microwave can be a piece of substantially expensive kitchen equipment to acquire. There’s however no denying that the benefits that this piece of equipment has are unmatched. First of all, a combi microwave owner will say goodbye to restricted and limited cooking options. 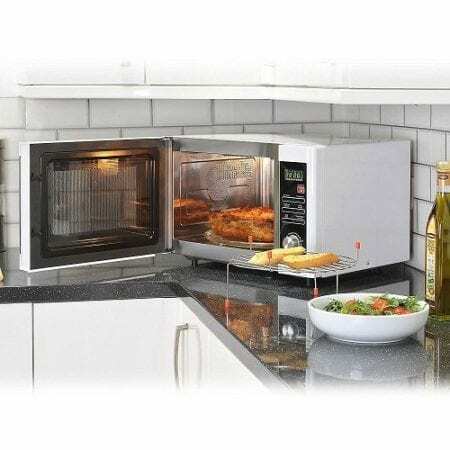 This is because, unlike the conventional oven, a combi microwave allows you to bake, grill, roast and microwave your food at a substantially higher speed compared to a standalone microwave or standalone oven. Secondly, a combination microwave has additional functions that you may not find in a conventional oven. For instance, you can see features like the auto cook menu, and inverter technology, as well as a powerful fan, assisted ovens in facilitating fast cooking. Most combi microwaves are also compact and stylishly designed to complement your kitchen décor without using up a lot of your worktop space. However, if what you need is merely the essential heating or defrosting functions, then you can avoid the high cost by purchasing a simple standalone microwave. The combi microwave is a piece of essential equipment at mealtime as long as it is used accordingly. The safe use of a combination microwave is what ultimately guarantees healthier and tastier foods. Here are the safety tips that you should know. For starters, you are supposed to follow the manufacturers' instructions at all time consistently. Secondly, make sure that any containers you put in the microwave cavity are microwave-safe. Using metal pans or aluminium foil in microwaves may result in unevenly cooked food. It is recommended to use glass, ceramic, and plastic containers that are labelled for microwave use. Another important safety tip is always to avoid using the combination microwave when the door is open. Adhering to these and other safety precautions can help you avoid lots of risks associated with the use of microwave ovens. Before buying a combination microwave, there are specific pointers that you need to put into consideration. Here are some of the most critical factors that can help you make the right purchase when it comes to a combination microwave. The first one is the power rating. Make sure you know the microwave, grill, and oven power rating before buying. The higher the rating, the better the performance to expect. Secondly, you should consider the capacity. Large capacity is always better especially if you are a large family but again, if you are a small family, then a combi oven with low capacity is fine. The price is also an essential consideration because combi microwaves can be really expensive. Make sure you buy the one that is within your budget. The appearance of the combination microwave can be a deciding factor for most of the buyers. You should select one whose design is appealing and can easily blend in with the rest of your kitchen décor. Although not very critical, the other features that you can consider when buying a combination microwave include the steam cooking function and the rotisserie feature. Q: Which One Should I Choose Between the Flatbed and Turntable Combination Microwave? A: The flatbed combination microwave provides more room in the microwave cavity thus allowing you to put in extra-large dishes and plates. Turntables, on the other hand, can be limited on space although we have others that accommodate large plates and bowls that go as wide as 340mm. Q: Between the Freestanding and Built-in Combination Microwaves, Which One Is Better? A: Freestanding combination microwaves are often considered to be better than their built-n counterparts because they do not require any installation.